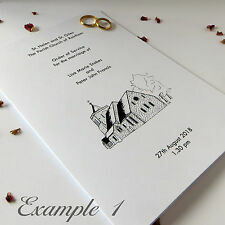 Personalised Wedding Order of Service Simple Affordable, Covers, Sheet, Booklet. SAME DAY DISPATCH AS STANDARD! 60+ DESIGNS TO CHOOSE! Size: A4 or any other smaller sizes. - Colour of the text and background (use the chart). Colour of the text (use the chart). 2-sided print - ask first for a price. THE PRICE IS FOR 10 CARDS. 10 x Watercolour Flower Style Order of Service Covers The listing is for the outer covers only. You will need to print the inside sheet onto A4 paper and attach. This can be done by folding your printed paper in half and stapling / attaching with a ribbon/twine etc. Covers are personalised with your details. Please message your names, venue and wedding date for the front cover after checkout, text colour can be altered to suit your requirements. A5 size when folded Printed on quality 300gsm smooth white card A full range is available in this design, please enquire. Thank you for looking. Listed is a 7.5" wedding program fan in peach and dark gray. Price is per fan. Once I have composed everything, I will send you a proof via PDF. Material: Cover: Old Gold; Insert: Navy overprint. 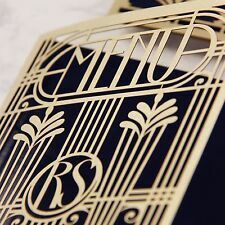 Handmade luxury invitation cover made from 285 gsm paper. Making the full order?. Thickness of the paper: Cover: 285 gsm; Insert: 120gsm. 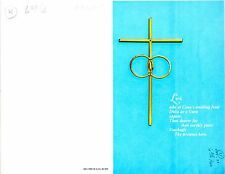 Included in price: Personalisation with bride & groom's initials on the cover & design of the insert. Affordable yet elegant. 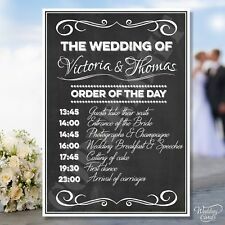 50 Wedding Programs (printed with your wording, 1 side printing). •Ordering Invitations - Press the "Buy Now" button. If any changes need to be made, we will make the changes and resubmit another proof for your approval. The wording, colors, and fonts are customizable. Once I have composed everything, I will send you a proof via PDF. This fan is two sided! A satin navy bow embellishes the handle of the fan. Gartner Program Cards for weddings and other events. The fan is two sided, and works best with limited information due to the shape. The wording, colors, and fonts are customizable. Price is per invitation AND fan. Funeral Programs These can be completely personalised around your needs! I can also do matching inserts or additional pages if required, and any other info you need can be added! They are printed onto postcard thickness 350gsm card. They are A5 size. You can have them printed on white or ivory. Proofs are sent prior to printing to allow changes! Colours / dove image can be changed to suit. (if there is a different quantity you need, please message me) All you need to do is purchase the item and complete your payment via paypal. Then email me with details of your order of service to: hello@theinviteshack.co Please note the turn around time is 7-10 days. Warner Press - Christian Arts U6183. New in plastic wrap. 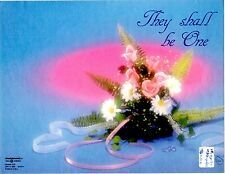 If we love one another, God dwelleth in us. You will receive a 40 count program kit. Perfect for printing elegant programs for any of your event needs. 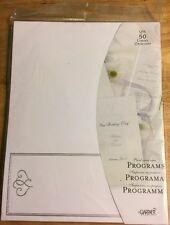 40 Ivory printable program papers (double-sided papers fold to create 4 pages per program). Choice of wax seal Silver, Gold or deep red. With Printed paper for the insert. buy it now for £15, you will receive 10. ivory, white or buff card for the outer cover. Warner Press - Christian Arts U6160. New in plastic wrap. It features the couple's initials in a beautiful large font on the front and tied with a red ribbon on the side. Program are totally customizable to coordinate with your even colors. Programs are fully assembled and ready to go when they arrive at your door. Item SC1360. This stationery collection is bold and not for the faint of heart. We do not print the inside with the ceremony details. The paper weight is 28 lb. text weight (compare to copy paper which has a 20 lb text weight). The fan is two sided, and works best with limited information due to the shape. The wording, colors, and fonts are customizable. Price is per fan. Fan size is 7.5" from tip to tip. Item SC1373. Don't be afraid to emphasize the seasonal nature of your winter wedding. The paper weight is 28 lb. text weight (compare to copy paper which has a 20 lb text weight). Back of program is blank/white. MARA-MI 'DEVONE COLLECTION'. Devone Collection#330951294883. Devone or Dominique #330951310421. Printable Programs in chic Ivory & Black. 25 satin ribbons. satin ribbons to finish the sophisticated look. This printable kit includes the pre-scored and pre-drilled cards and sheets to create 25 eight-page programs, each tied with a Pearl White ribbon. Paper color: pearl white. Warner Press - Christian Arts U6240. Yellow - Flower Girl. New in plastic wrap. Item SC1337. The paper weight is 28 lb. text weight (compare to copy paper which has a 20 lb text weight). Back of program is blank/white. Item SC1332. The paper weight is 28 lb. text weight (compare to copy paper which has a 20 lb text weight). Back of program is blank/white. Print your ceremony details on the reverseside of the program. Item SC1336. This stationery collection features the Fleur de Lis, a stylized lily which is commonly associated with the French. It is widely used in family coat of arms as well as art and architecture across the world. Gartner Brides Program Kit 80 Black and Ivory New !! NIP !!! If it don't feed it's self in my house it don't live here ! You get everything in the picture ! i have no dogs cats ect ect ! Item SC1097. Ivory embossed border trifold wedding programs. Gartner new pack of 50 tri-fold programs. White with a pearl border. The beauty of nature's hydrangea whimsically decorates our Laura Ashley Hydrangea Program Paper. 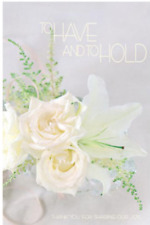 Ideal for any season, these programs will be a standout during your ceremony! Perfect for the do-it-yourself bride, our printable programs are easy and fun. Printable Digital Wedding Program - no limit on how many copies you print clIn. Wedding Party. Included in your design. Take to your professional printer. 6 sections for trifold approx 3.6" X8.5". How to send your information. Item SC1355. Carry on the tradition with this peacock feather stationery customized in your very own wedding colors. The paper weight is 28 lb. text weight (compare to copy paper which has a 20 lb text weight). Personalized wedding programs created just for you! We provide unlimited revisions of your proof, so you can be sure to get exactly what you want. If you need more than fifty programs just add to the quantity. The fan is two sided, plenty of room to display your order of service. The wording, colors, and fonts are customizable. Once I have composed everything, I will send you a proof via PDF. Item SC1339. The bold pattern of the Love Bird Damask Stationery Collection features the well known damask style with perfect wedding details. The flowers twist into delicate little hearts that are interspersed flawlessly within the pattern.